Whispers in the Loggia: Nuncio's "Norms of Efficiency"
The various Vatican diplomats accredited to the United States over the years haven't usually been the type to garner curtain calls. But since setting up shop -- or, as he calls it, his "laboratory" -- at 3339 Massachusetts Avenue NW, that's what Archbishop Pietro Sambi's been getting. And with good reason. Since coming to Washington in early 2006 after seven years as the Holy See's man in the Holy Land -- where he left with the affection of Palestinians and Jews alike -- Sambi has acquired something of an outsized profile for a DC nuncio. He takes more invitations than his predecessors, revels in tossing scripted remarks out the window and, despite a rich accent, has shown a repeated ability to move audiences in a way the native speakers of the hierarchy he's charged to watch would often be hard-pressed to imitate. Touching down in California for the first time in late January, the nuncio drove an installation-day crowd of 1,800 wild by telling Bishop Richard Garcia of Monterey of his unawareness that, calling to inform Garcia of his appointment to the diocese based in the Italian-esque fishing village, Pope Benedict was asking the installee to be the "bishop of Paradise." When, at the same event, outgoing Bishop Sylvester Ryan's name was mentioned in the bull of appointment and the congregation began to clap, Sambi exclaimed that "gratitude is the sign of a Christian community -- this is a Christian community!" and proceeded to (literally) applaud back at them. 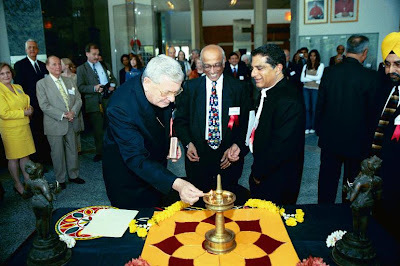 Last year, the archbishop co-helmed an interreligious dialogue at Washington's John Paul II Center alongside the Indian spiritualist Deepak Chopra (with whom he's shown above, lighting a Hindu rangoli); "Religion [is] peace, but when religion is instrumentalized… it becomes the worst instrument in a peaceful society," Sambi said at the time. After controversy ensued over Pope Benedict's speech at Regensburg, the archbishop, who served for seven years as nuncio to the world's largest Muslim country, Indonesia, promptly received a group of Muslim leaders to stress the Holy See's commitment to dialogue, and took to EWTN to assert the church's respect for Islam. Visiting New Orleans last fall, the veteran diplomat moved Katrina relief workers to tears with his impromptu words of appreciation at a Mass. And, in a break from his predecessors, he doesn't impose an Italianate pronunciation on the word "shepherd." Sambi's been no secret to veteran readers of these pages, but word's starting to spread: on no less than the religion blog of the Dallas Morning News, one scribe caught whiff of but a few of the nuncio's words of wisdom and urged readers to pass them on. [A] young man, 22 years old, once took a piece of marble and sculpted in it two of the most deep human sentiments: suffering accepted from the hand of God does not diminish the beauty of the human person but increases it, and -- second sentiment -- even in death, a son continues to have full confidence in his mother. This is the Pietá of Michelangelo, that you can see everytime you enter in the Basilica of St Peter in Rome. Michelangelo, the author of the Pietá, is considered one of the greatest artists in the world. I don't believe it! The greatest artists are the educators -- are you -- because you try to sculpt the best of yourselves, of who you are and what you know, not in a piece of marble, but in living, breathing human beings, who are the glory of God. The son and brother of schoolteachers -- who, while other prelates politely wave or nod, routinely jumps up from his chair when he's recognized at official functions -- was so immersed in his pep-talk that, with apologies that "even nuncios have the tendency to slip," he later re-commandeered the podium from NCEA chairman Archbishop Donald Wuerl of Washington to fulfill "the main purpose" of his address to the 8,500 gathered Catholic educators: to extend the greetings, warm wishes and blessing of Pope Benedict. The three other senior prelates onstage tried to outdo each other in the cavernous hall that morning. Sambi upstaged them all. At last month's National Catholic Prayer Breakfast in Washington, while media coverage focused on the appearance of President George W. Bush and Wuerl's keynote address, the Vatican representative -- after observing that, just as "[American] Catholics feel the need to pray according to the spirit of the first Christian community of Jerusalem," they "need also breakfast" -- sought to draw on his nearly four decades of representing the Holy See in various locales the world over in offering some "norms of efficiency in the Catholic church." First, a clear identity. A person of confused identity is of no use to anyone, not even to himself; a drop of wine in a big glass of water will disappear. Clear identity -- Catholic identity. Secondly, a sense of belonging. You need a community, a community of believers. The community needs you. Who walks alone, earlier or later, will be lost. Third: exceptional qualities. Especially when you are a minority you cannot emerge and have influence in society by numbers, the unique way is through exceptional qualities: personal qualities, family qualities, professional qualities, spiritual qualities. If you are not convinced of this, ask it to the Jewish people. And when you have a clear identity, a sense of belonging and exceptional qualities, be ready to collaborate with everybody to defend life and to improve the quality of life. Though Sambi's 14 months in Washington have amassed a level of goodwill said to be unseen in the States since the early '80s heyday of the master of finesse Pio Laghi, the current mission chief isn't without his critics, but they number very few. One prominent church conservative was recently overheard attempting to tar the nuncio as a "do-nothing." And after telling the US bishops at their November meeting in Baltimore that they face the "serious and challenging" difficulty of a "loss of credibility," implying its root in an ignorance of the Scriptures -- which, he said, the church in the States is "thirsting to muster again the courage to experience" -- it didn't take long for one senior prelate to remark that, so he felt, Benedict's man in Washington had "turned the knife" on the nation's hierarchy. Then again, as one of his circle sized up the nuncio's naysayers, "he tells them what they need to hear." Just as with the Catholic educators... the Muslim leaders... the Katrina relief workers... and the faithful of the place he calls "Paradise."